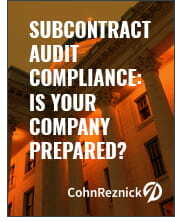 Subcontract Audit Compliance: Is Your Company PreparedSubcontract Audit Compliance: Is Your Company Prepared? A renewed focus on contract closeout has led to confusion around who is responsible for subcontract audits. The Defense Contract Management Agency has made its position clear, stating that the prime contractor is responsible for auditing and closing subcontracts. Read more to discover how to determine if you may have a responsibility for subcontract audit and how to successfully achieve a compliant solution.